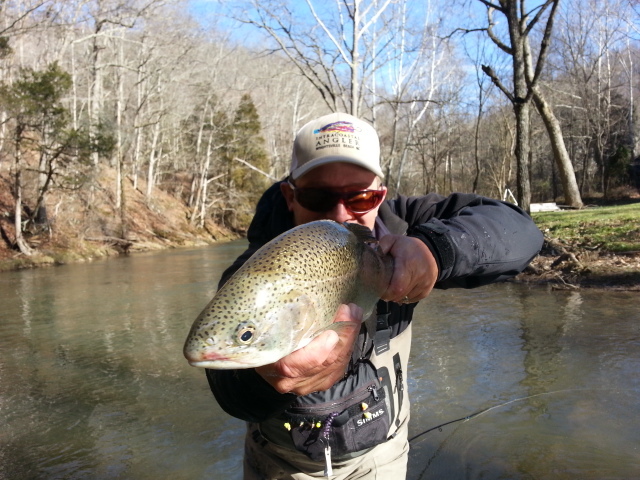 Jeff Wilkins Fly Fishing Real Time Fishing Reports…… Where Fly Fishing is a Professional Passion…..
Sun. Mar. 29, 2015…..Will have a busy week coming up, covering lots of ground in the process. Tommorrow I am set to guide a group of experienced anglers from PA, Ken Okorn, Mechanicsburg, PA, Bob Thompson, Carlisle, PA, Chris Yasher, Harrisburg, PA, Jim Ritter, Enola, PA, Tom Brennan, Carlisle, PA, and Chet Hagenbarth, Carlisle, PA. Because of release times on the tailwaters we’ll be fishing to start on the NC side fishing til midday and then heading over to hopefully get into the blue winged olive hatch on the South Holston. Will begin Tuesday guiding a trip with Colter and Chip Cavin, Canton, GA, and we’ll be fishing a couple of NC waters for the day. Wednesday I have the Fly Fishing 101 Class at Guilford Tech Community College, and we have a full group of 12 students. Should be a great class. 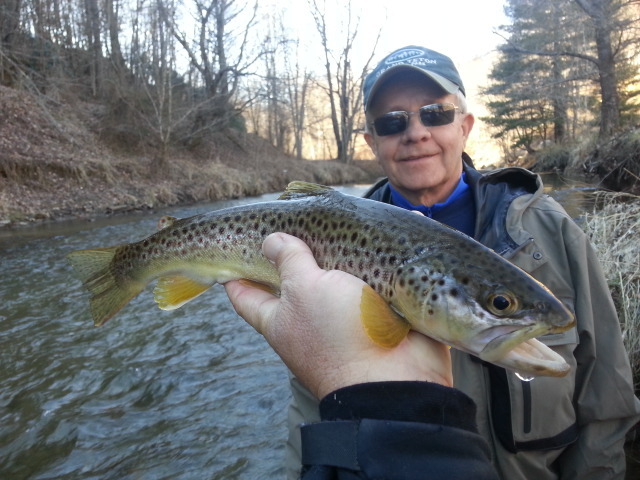 I end out the week with a Thursday trip, guiding Ted Linczak, who is traveling here from Ohio, and for Friday guiding Shaun Redgate, Forest , VA, and both Thursday and Friday trips will be on private water. To finish up the week I’ll be guiding a trip with Pete Bradley, Lexington, NC, and his nephew, and we’ll be fishing NC water as well. Busy week for sure! 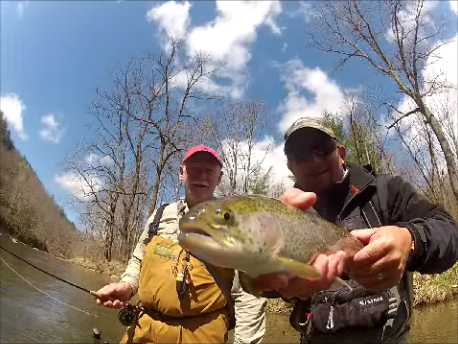 We have just completed another fly fishing video, this one entitled “Trout Bummin’ It….Appalachian Style…”. I shot this over last weeks three day trip guiding Bob Schwirzke, Fayetteville, NC, Peter Valenti, Pinehurst, NC, and John Pratt, Burlington, NC. We had some great fishing over 5 different waters in 2 1/2 days and had great weather to boot. Here’s the video below, you can also view it by clicking here . We have had a great start to the season so far, even despite some obstacles and weather issues. We press on. Looking forward to a great rest of our spring season and year. Should be a great one……hope to spend some of it fishing with you. Bookings are up over last year and we are booking early. Sat. Mar. 28, 2015…..Another bizarre weather week for sure in Appalachia….we’ve had a touch of everything between 15F and 75F that you could think of. Rain, snow, sun, wind……sometimes calm. Beginning to sound like a broken record for sure, but that is how its been all week. And we’ve been out in it. 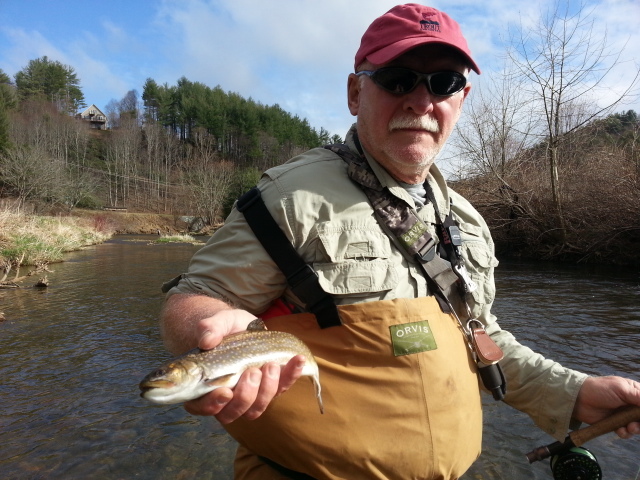 I did our annual Spring Trout Bum trip this past week and had some great days in the NC mtns , gorgeous days guiding Bob Schwirzke, Fayetteville, NC, Peter Valenti, New York, NY, and John Prat, Burlington, NC, and we had great fishing. Sunny skies and 60s pushed water temps up and it’s 50sF …and tons of Caddis came off. A GADZILLION of them…We did some lake fishing the first evening and landed some crappie, rainbows, and a lone brookie, then fished 4 other waters in two days. Had a great time…. We had great dry fly fishing and nymphing. 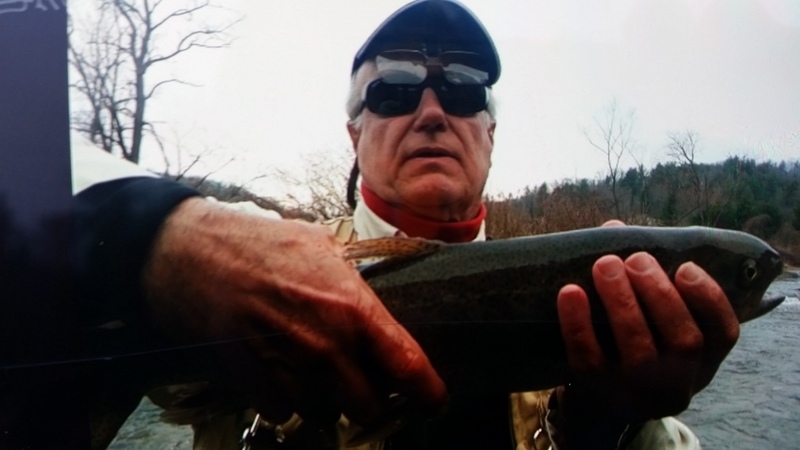 We have landed well over 50 fish the first day, including many quality rainbows in the 13 to 17″ range and the best fish an 18″ fish landed by Bob Schwirzke. We were at 50 fish and the largest being 17″ , Peter had fish of the day, a 23.5″ rainbow. Caddis are hatching in droves, tons of caddis #14, 16, 18 all over and the fish were going beserk. We caught a bunch of fish on dries, and a lot on nymph rigs as well. Day three was excellent as well, dark caddis continue to hatch all over as well as some #18 bwos and a few Quill Gordons. 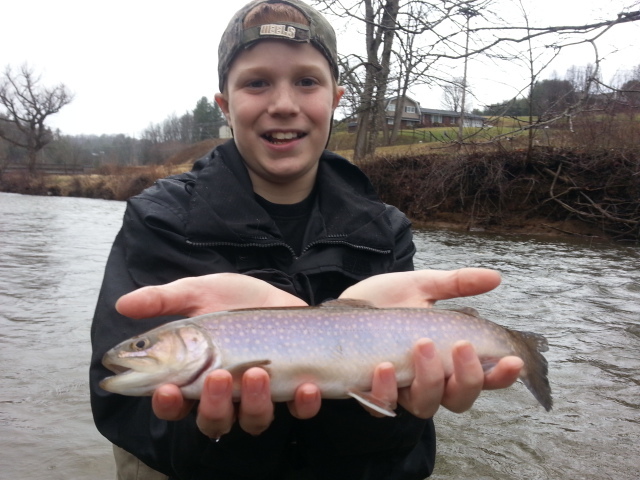 We caught about 40 or so, a mix of browns and rainbows and brookies, and fished two other waters. Landed fish on a variety of nymph patterns, and the rains held off til very late. We didn’t get dumped on, but many areas had heavy thunderstorms. On Thursday I guided Brad Ball & Stephen Starnes, Greensboro, NC, a NC North New River float was our plan, but heavy rains and then an inch or two of snow changed it all. 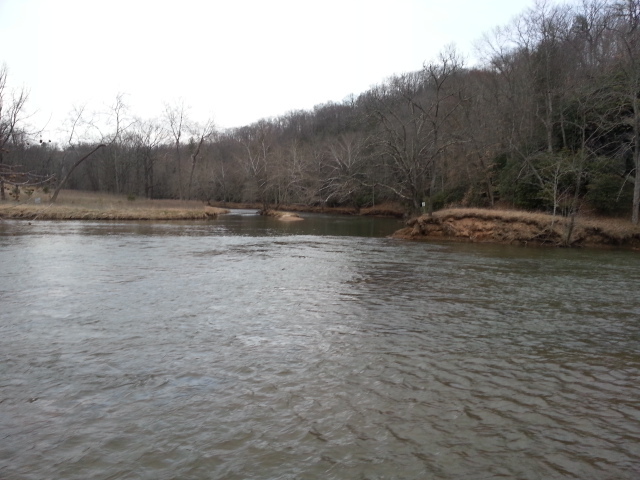 We ended up floating the South Holston, opting for a late morning start. We caught some fish early on, all on nymphs, and had several fish come unbuttoned. Christened a brand new Sage ACCEL 9’6″ 5 weight and it was beyond the sweet jewel I’d thought it would be. 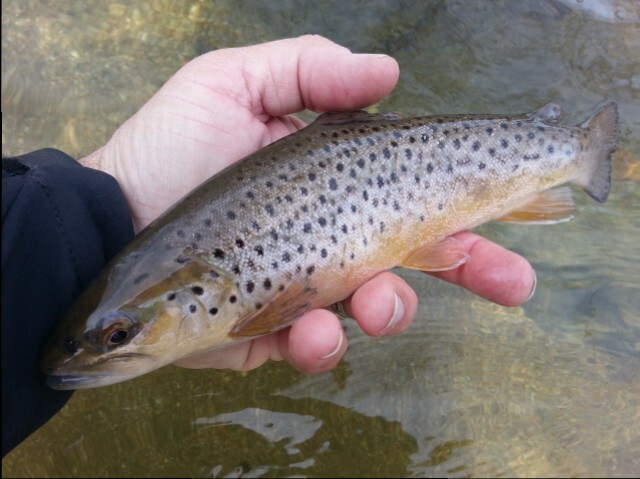 One of the finest 5 weights I have ever tossed, it caught a brown trout on its first cast….a wild SoHo brown at that. We floated the upper river, and I must admit it was quite the raw day, the kind that is tough regardless of how tough you are. It was cold, snowy, and raw with winds up to 40mph. It had snowed all morning, sometimes pretty heavily. We landed about a dozen fish I’d guess, fishing in horrid conditions. A light bwo hatch at the end of the float provided some dry fishing to some rising fish, as a nice hatch of size 20 blue wings, the fly du jour for March on the SoHo, came off even in the horrible conditions. I felt pretty good that we got several of the risers to eat one of my minute, dainty size 20 CDC thread olive dun olives and boated some fish while only one other boat caught a fish near us…..and there were several a ton of boats around of us and floating through. The temps started to drop, and it was nearing 6pm, so we floated to take out wanting to avoid getting into the next round of snow that was supposed to start shortly after we left the river. They got snow after we left, from a dusting to as much as a couple of inches in some spots. 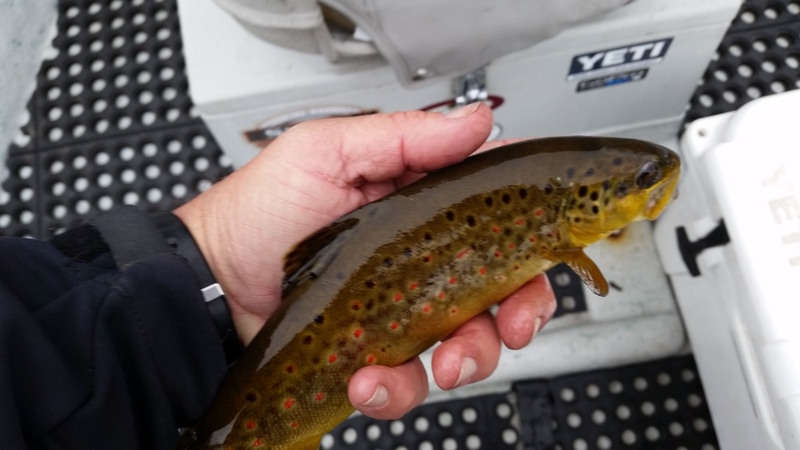 Have another busy week coming up, on Monday I will have a group of anglers from Pennsylvania I’ll be guiding on the South Holston, some of my regular clients who come here several times a year and year after year. Should be a blast. 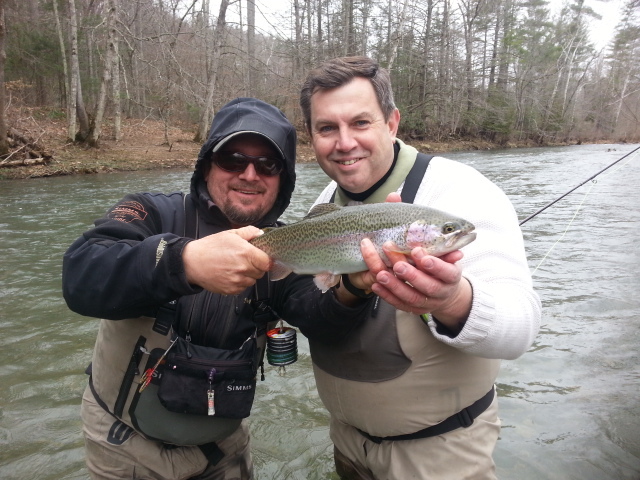 Tuesday I’ll be guiding Chip and Colter Cavin, Canton, GA, the I’ll be doing the Fly Fishing 101 class on Wednesday. Thursday I am guiding Ted Linczak, Atlanta, GA, Shaun Redgate, Forest, VA on Friday, and on Saturday Pete Bradley, Lexington, NC. Should be a busy week with lots of action. Will be posting lots of pictures. Have a great week….tight lines and may all your hatches match. Warm 70F for Two Days…..Now Snow Again…. Fri. Mar. 27, 2015…. 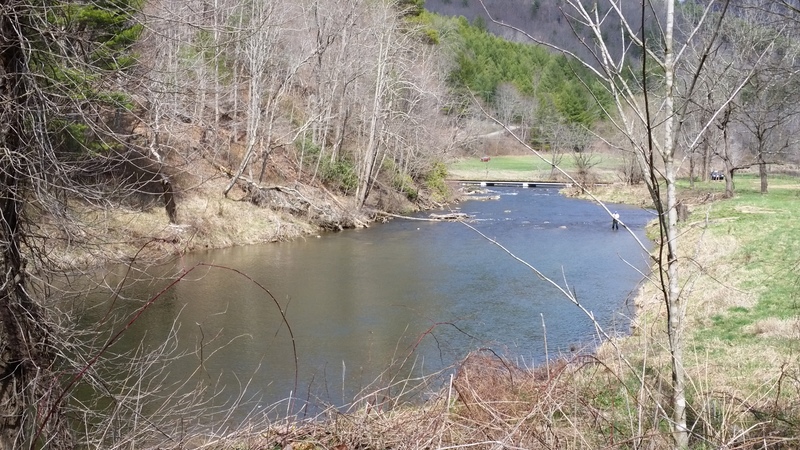 Day two….Great day in the NC mtns , gorgeous day guiding Bob Schwirzke, Peter Valenti, and John Pratt and we have had great fishing. Sunny skies and 60s have pushed water temps up and it’s 50sF …and tons of Caddis coming off. A GADZILLION of them… We had great dry fly fishing and nymphing. We have landed well over 50 fish, including many quality rainbows in the 13 to 17″ range and the best fish an 18″ fish landed by Bob Schwirzke. 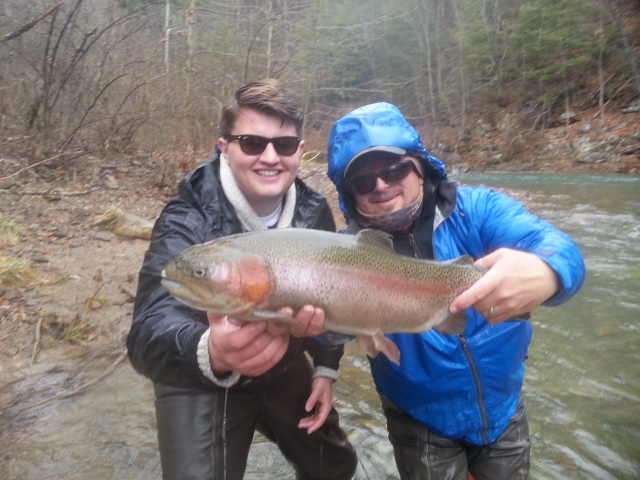 We were at 50 fish and the largest being 17″ , Peter had fish of the day, a 23.5″ rainbow. Caddis are hatching in droves, tons of caddis #14, 16, 18 all over and the fish were going beserk. We caught a bunch of fish on dries, and a lot on nymph rigs as well. 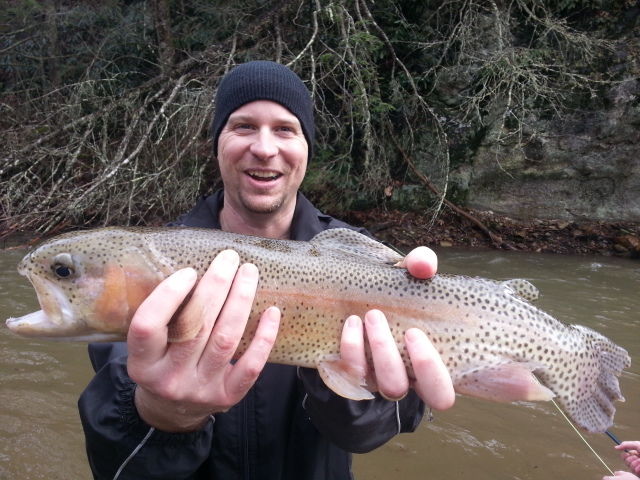 Day two we fished Watauga Gorge and one other water and landed 40 or more fish so another great day. 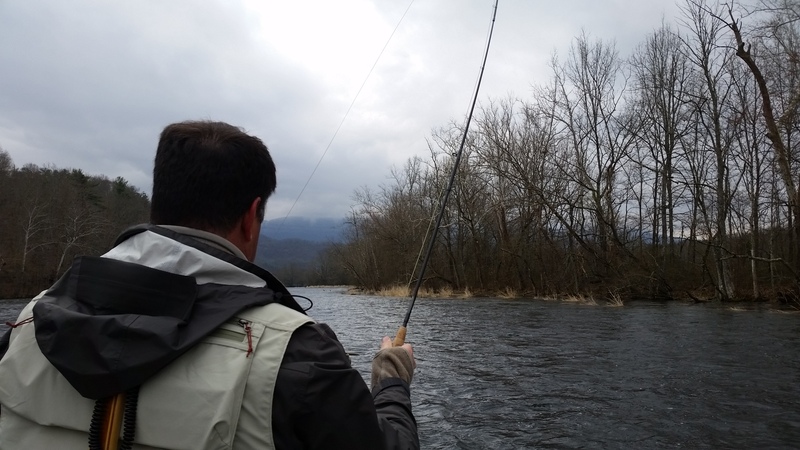 Weather moved in last night and this morning I drove through heavy snow showers over to do a South Holston float this morning. It’s cold…….and I’m ready for warm weather…. Wed. Mar. 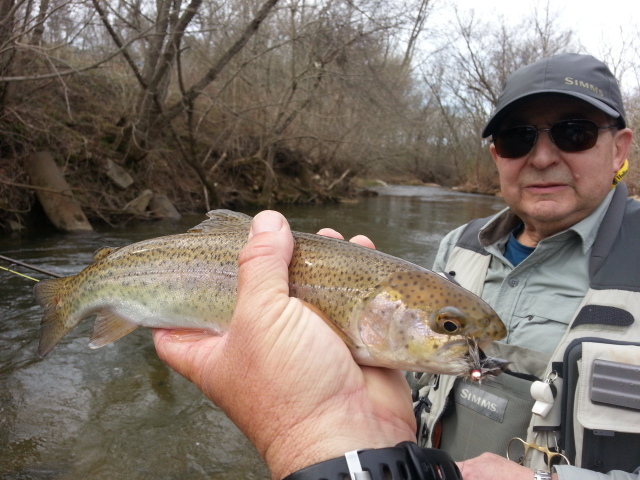 25, 2015…..Great day in the NC mtns , gorgeous day guiding Bob Schwirzke, Peter Valenti, and John Pratt and we have had great fishing. Sunny skies and 60s have pushed water temps up and it’s 50sF …and tons of Caddis coming off. We have had great dry fly fishing and nymphing. We have landed probably 40 fish, including many quality rainbows in the 13 to 17" range and the best fish an 18" fish landed by Bob Schwirzke. We are headed to another stream in the area and are hoping to get in some more dry fly action before the rain sets in. 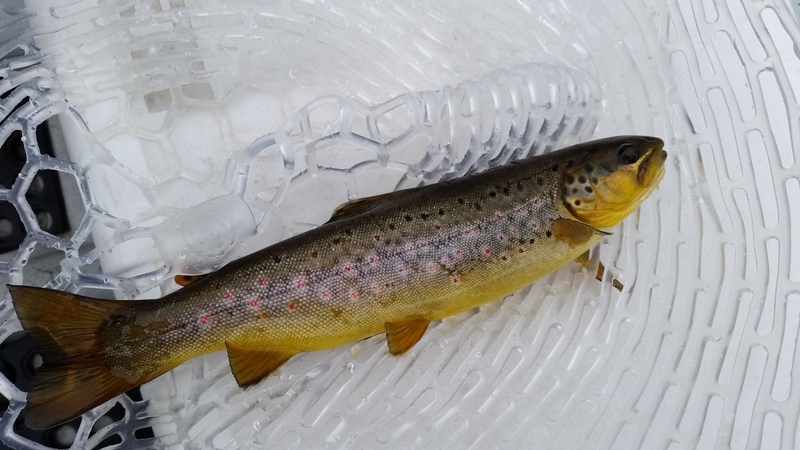 Another Great Day…….Dry Fly Action Too…. Sat. Mar. 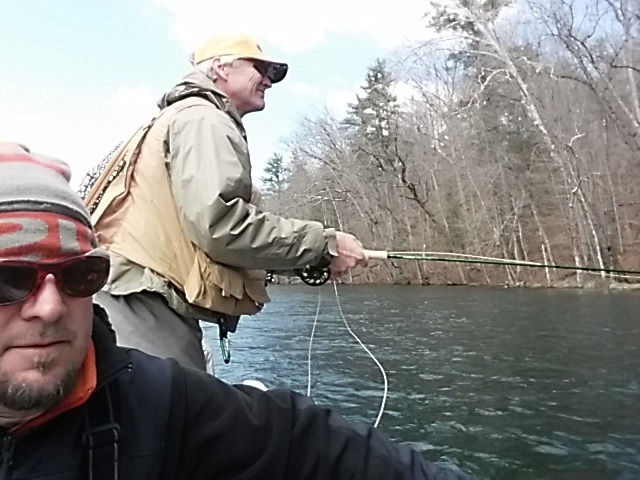 21, 2015 …..Did another guided trip guiding Patrick McDaid, Greensboro, NC, NC Mtns, another good day and an absolutely fantastic weather day….big contrast to fishing in snow a day ago. Today it was sunny and near 70F. I met Patrick early and we were in the water shortly after sunrise. I knew the first sunny Saturday in a while would mean the potential for other anglers. But we pretty much had the water to ourselves. We did pretty well, catching fish early on bobber rigs and then switching to dries and had a decent hatch of size 18 dark caddis. We nailed several nice fish on dries. Good day, probably 25 fish, we quit about 3pm as Patrick needed to get back. Good day, nice weather, Patrick was a blast as always. 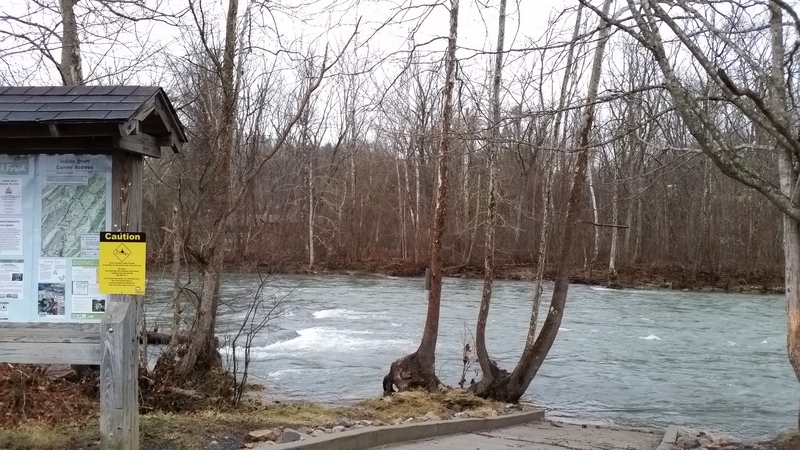 River temps are 50F now so dry fly fishing should begin to improve. Lots of bugs, plenty of caddis, Adams Paras,etc, will go a long way toward catching some fish on top. Another busy week coming up, trips everyday except Sunday and hope the weather cooperates. Should be continued good fishing as water temps are approaching and reaching the 50sF during the afternoon hours which means bugs and rising fish. This report is a short one, in late everyday and working on little shuteye. Time to remedy that. Fri. Mar. 20, 2015…..I think spring is here. A busy week, the busiest all year, on the water a lot, enjoyed everything from 15 to 20F to 82F and everything in between. If it was sun,hot, cold, cloudy, wet, rain, snow, sleet, you name it I have been in it the last week. How do you go from cold to upper 70s to low 80s and fishing in short sleeves all day to a day and a half later fishing in heavy snow showers. REALLY?????? 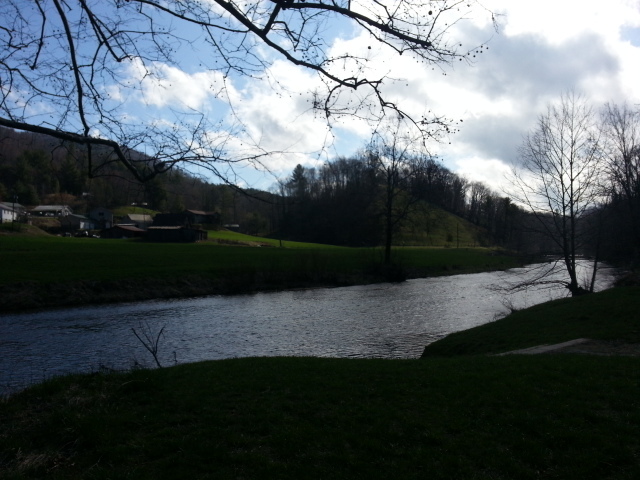 Springtime in the Appalachians is what you call it. A great week it has been though. Yesterday was very interesting weather wise…I guided Wesley & Eli Gormus, from Richmond, VA, two regular clients that I get together with every year. I had mentioned in my report Thursday morning that the day could be epic w/ the nasty weather, a big fish day too as I felt the time was right for some bigs….really big….. I met Eli and Wes mid morning, we decided to get a leisurely start as it was cold and the forecast was rain to rain/snow to snow. I rigged each of their rods up with a right angle rig I have been using the past few months, using a Strike Foundry indi, and a pair of nymphs, one large attractor pattern followed by a large PT beadhead/flashback or a large Bead head hares ear…..two great spring nymph patterns. We were into fish pretty quickly, the first 4 came on 2 doubles, one fish each for Eli and Wes, a fish on at the same time. Netted them, released them……repeat. Happened again, so a good start. We worked our way upstream, the water was right at 300cfs, or perfect for nymphing heavy rigs, and water was 42F. We also a short distance upstream from where we started ripped a few streamers…..which put several fish in the net up to 22″, many of them delivering arm jolting strikes as they would slam the streamer in mid presentation. Fish were podded up so where we caught fish we caught a good many. 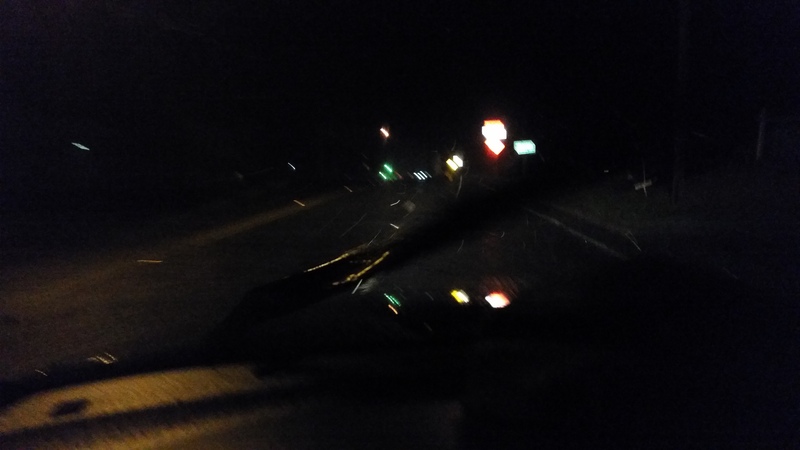 We fished all day in on /off rain/snow showers….which by midafternoon was all snow. We fished our way upriver and finished at two of my favorite deep runs/holes, and caught several more nice rainbows and browns…..and Eli caught two ‘monstas’…..one of them a fish of nearly 30 inches and 10lbs that was lit up like a Santa suit…..bright red. 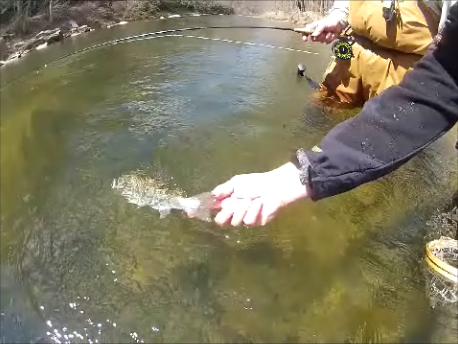 We finished the day ripping streamers again, and caught a couple more fish. Then the guys decided to call it a day…it was near 6pm and still snowing and really cold and breezy. I drove all the way back to NC/VA in the snow, some areas had a couple of inches or more. Its spring right? Strange…..but not out of the ordinary per se. Was looking back at my detailed fishing logs and the same thing happened last year same time. March 20, I drove through 6 to 10 inches of snow and it was so heavy driving in it at times that is was whiteout conditions. Made it back safely though, and really late. So this report is technically late I guess….but gotta sleep sometime! Water’s really up all over VA, they have gotten so much snow and rain over the past three months. I went by the Jackson River, a river I used to fish and guide 80 days a year or more on, and that I still float and fish, and it was out of its banks. Highest I have ever seen it really. The Gathright Dam /Army Corps is dumping a ton of water. Makes it tough downriver on the James too, which is created by the confluence of the Jackson and Cowpasture Rivers near Iron Gate, VA. An inch of rain and a few inches of snow, as I drove through on the way back (below), will likely raise it a little more. 18 compartment JWFF Logo box above, a clear polystyrene box w foam dividers and a magnetic back, great for storing small flies, nymphs, etc., and it holds a ton of them. Our signature tailwater box, and great for a nymph box for anywhere. Click here to view or purchase. Logo fly that adorns our circle logo was pen and ink sketched by me. Check ’em out here . 8 compartment JWFF Box (above) made of clear polystyrene box w foam dividers and a magnetic back, great for storing small flies, nymphs, etc., and it holds a ton of them. Our signature nymph box, and great for a nymph box for anywhere, lots of customers use these for a “stream specific” or seasonal box for seasonal patterns. Click here to view or purchase. Logo fly that adorns our circle logo was pen and ink sketched by me. Check ’em out here . JWFF Swingleaf Fly Box (above)….Our bread and butter nymph box features a swing leaf, this box holds over 500 nymphs and small flies.These boxes slip into shirt pockets, vests and packs. Light and accessible. Great box for all nymphs, great for dries too as it has plenty of room and won’t crush hackles. 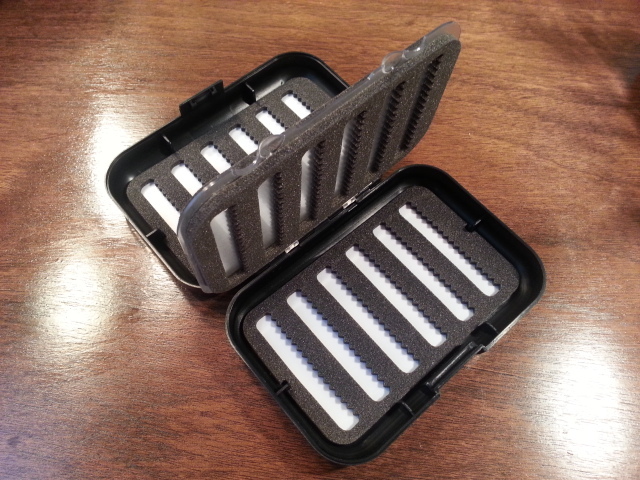 Durable because the fly ‘backs’ into the slot rather than hooking into the foam, so the foam never gets torn. This box holds a ton of flies, and especially so with the page in the middle , which holds flies on both sides, essentially doubling the capacity of this type of box. 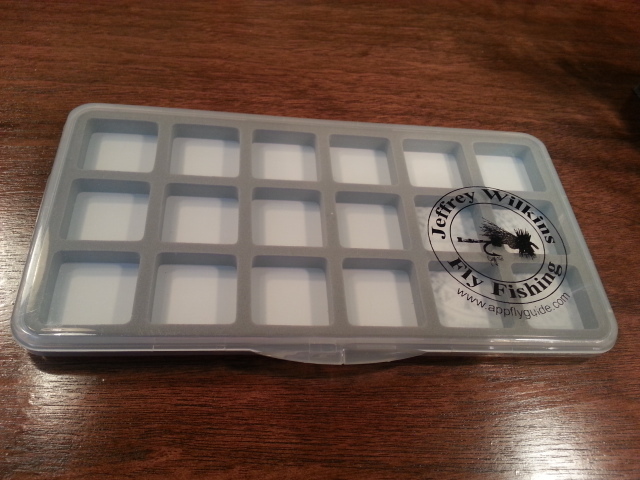 This type of fly box will hold more flies than any box you can use…literally holds an INSANE number of flies. 5.5″ x 3.5″ x 1.25″ Black. Click here to view or purchase. New In-Line Suspender Strike Indicator. Our standard 3/4 inch in-line stealth indicator, the ultimate suspension tool from Strike Foundry. A smaller version, called the Lil’ Nugget, is available in 1/4 inch. Pick your color, 2 Strike Indicators per pack. Available in Chartreuse /Gray and Orange/Gray. I have used these extensively and they are fantastic. Easily castable, float like a cork, super sensitive, a variety of rigging options unlike other indicators. I still have the first one I started using and still use it as they don’t wear out. It’s in-line rigging allows for increased strike sensitivity and ease of mending as it rides high in the water. The two best things about this indicator however is it does not create kinks in your leader, and it’s strike sensitivity is unmatched. 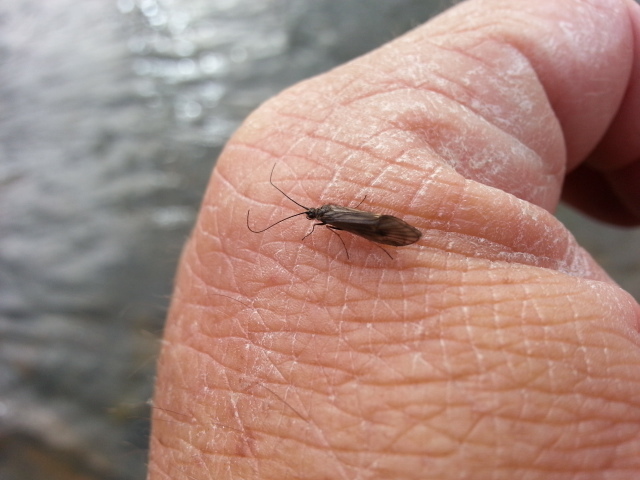 It is possible to switch from a nymph rig to a dry fly quickly without having any damage done to your leader like some of the more popular indicators do. Also the strike sensitivity is superb. In addition to the Indicators, included is a “Tips Sheet” on rigging them and using them, more tips than any currently advertised/sold on the market today. I will show you how I use them on guide trips both wade fishing and floating. I have four of these indicators I have put well over 250hours of fly fishing on, they have been cast, snagged, tangled, banged up on rocks, caught a ton of fish, beaten and banged up fishing from the driftboat, wade fishing on local waters, chasing the huge, trophy fish on our private waters…..all 4 are in just as good shape as when I first took them out of the package. Try that with another indicator. I could concievably see using one or two indicators per year if you can keep them from throwing them 20 feet up into a tree. They are indestructible. Im glad as I got tired of going through so many Thingmabobbers. When you are on the water almost everyday it is big deal to not go through so much terminal gear . Click here to view them or purchase. Our customers love these guys, they are FREE with the purchase of a dozen of our fly patterns but are so handy that folks love them and end up keeping them for organizing. 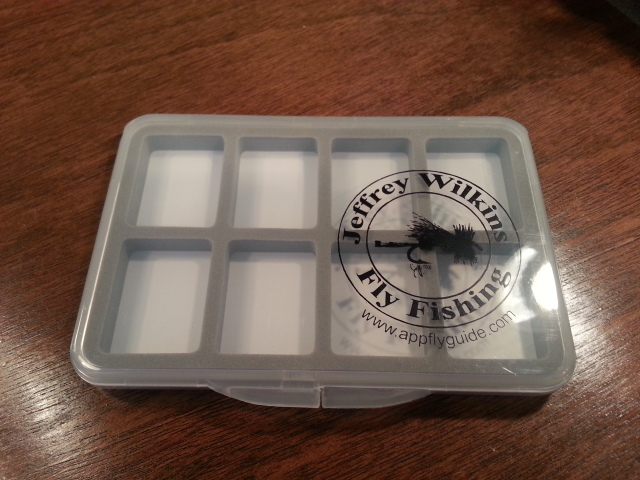 Keep several different flies in one place with this four compartment tethered fly cup. 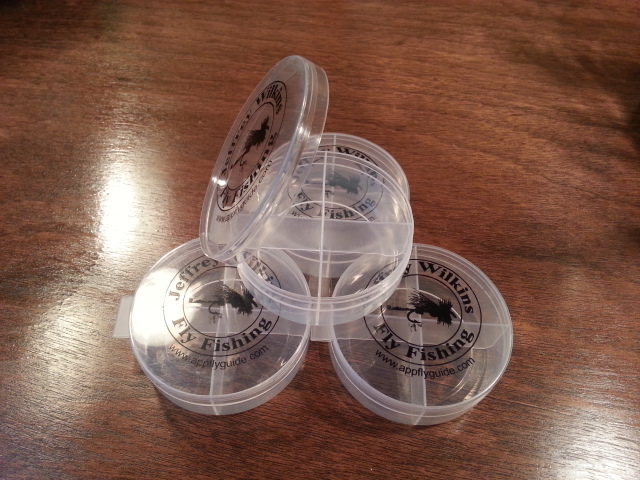 Made form durable clarified polypropylene 2.5″ x 7/8″ deep, perfect for holding a small assortment of flies. Also, great for not only organizing flies, beads, hooks, etc. and more. Imprinted with our JWFF logo. Click here to view or purchase . Winter is fly tying season but so is spring if we have bad weather days or blowouts and that is always going to happen at some point. 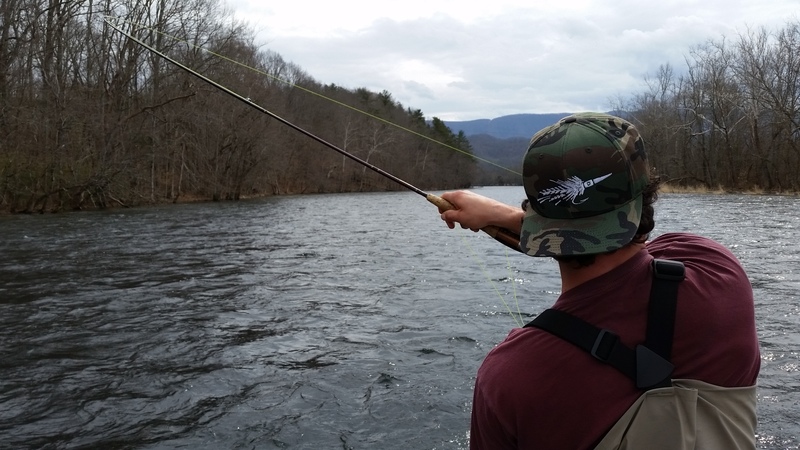 The above fly is a fantastic fly for trout and smallmouth, particularly our smallies on the New River. They absolutely eat it up. This was easily our #2 fly for streamer fishing last year on our smallmouth float trips. What’s #1? Let’s go fly fishing and I’ll give you a half dozen of them. Pleased to be joining the Hatch Reels Pro Guide Team starting this spring. John Torok and Danny Ashcraft created this line of reels a little over 10 years ago and in that time Hatch is perhaps the premier fly reel at this time. Hatch is deeply rooted in not only the saltwater industry, but the freshwater and trout markets worldwide. 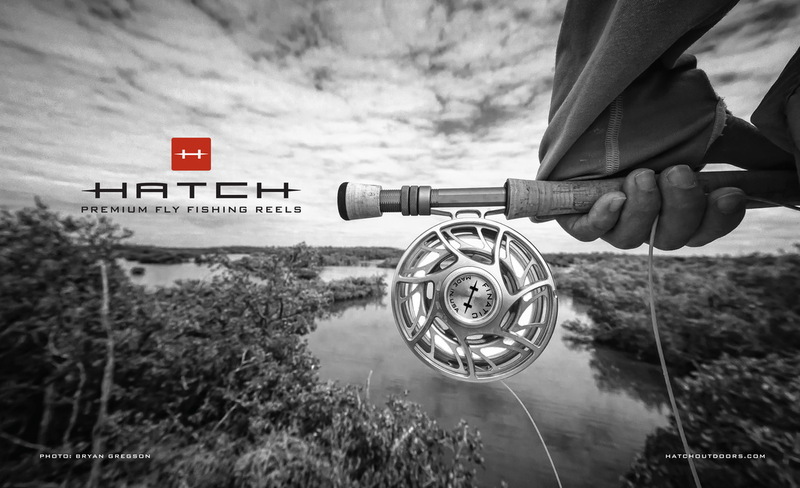 Hatch is growing as the number one trending reel company in the world and this opportunity is a great way for you to set yourself and your company apart from the rest. Hatch is highly respected in the industry for developing the strongest and most durable reels for any situation that can be delivered. You can check out the Hatch Reel Line here . Looks like this is well into the beginning of one of my busiest times of the year. Our Fly Fishing 101 class slated to begin in the next 2 weeks is full, have a full group of 12 and it will be fun to share the passion and how to of the sport to them. If its like usual, I’ll learn as much or more from them as they do me. In any case, it will be a blast for sure. Funniest quote or thing I’ve heard this week……“60% of the time, it works every time.” Right on man…. Thurs. March 19, 2015….We have enjoyed some warm, spring like weather but a big change is on the way. Today. Looks like a soggy two days coming and more seasonable, if not chilly temps. Lows over the past 4 nights have been in the 30s and that has bumped water temps back down into the low 40s… after a week of warm temps had afternoon stream temps in the low 50sF. 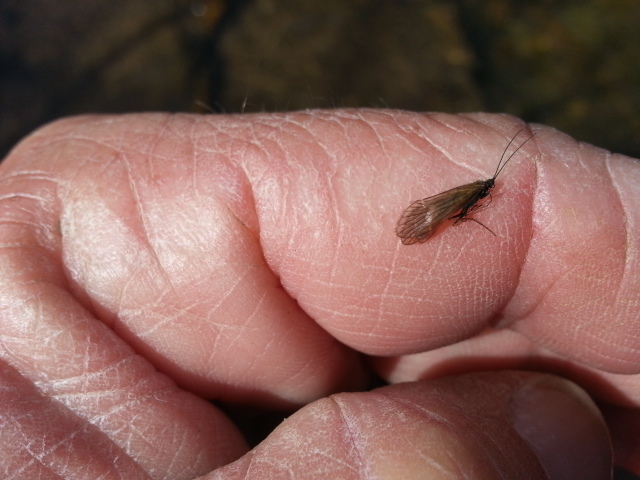 Those colder water temps have quelled the emergence our large mayflies for now. On Wednesday I did a guided Trip, Ron Zambor, Clemmons, NC, NC Mtns, met Ron and his friend John in Yadkinville, NC and we were off. Early start, another nice day only cooler , it was cold to start, in the low to mid 30s. Finally reached the mid 50s, but still way off from the 70s and 80s we have been having. 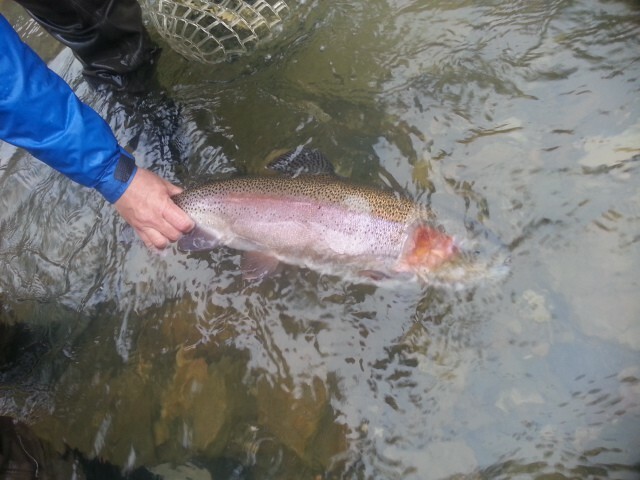 Didn’t take long to get into fish though, we had a good day catching a mix of browns , rainbows and brookies. All fish on nymph rigs, the water was still way up where we fished , and it also still had some color. A good day though, we used double nymph rigs under a Strike Foundry bobber rigged right angle style and as it has so many times lately it worked like a charm. Guess we netted 30 or more , so it was a good day. In late, up early and out again on Thursday. I will be guiding Wesley and Eli Gormus of Richmond, Va, on Dunlap Creek in Va. We have 298cfs flows and 43F water temps and looking forward to a good day. We will likely be chasing bobbers all day but that’s ok. We should catch some large fish with conditions as they are. Have a good one, will post more later today. …. From Busy to Busy Beyond Belief…. Tues. Mar.17, 2015….Happy Saint Patrick’s Day….at least the water was green today and not brown. Been really busy the past week, hard to keep up with reports. Have had some huge fly orders to wrap up, flies to tie for some upcoming guided trips….. and also to prepare for the rest of March which is going to be incredibly busy. This past week did some floats plus a half day lake trip, we did pretty well, the water around here in our local lakes is about 45 to 48F, and all are still very off color, to even muddy in some respects, depending upon location and location on each lake, as one end might vary from the other a bit. But fish have begun to move shallow, we caught fish on a variety of jiggy flies…..a mix of about 15 to 20 yellow perch ….”Coontails” as they are called and as local ‘southern’ vernacular would dictate, several bluegills, and several bass. I’d guess about 30 fish in all. Some fish are shallow but not as much as they will be…..caught a lot of fish down to about 16ft….some as shallow as 6 feet. 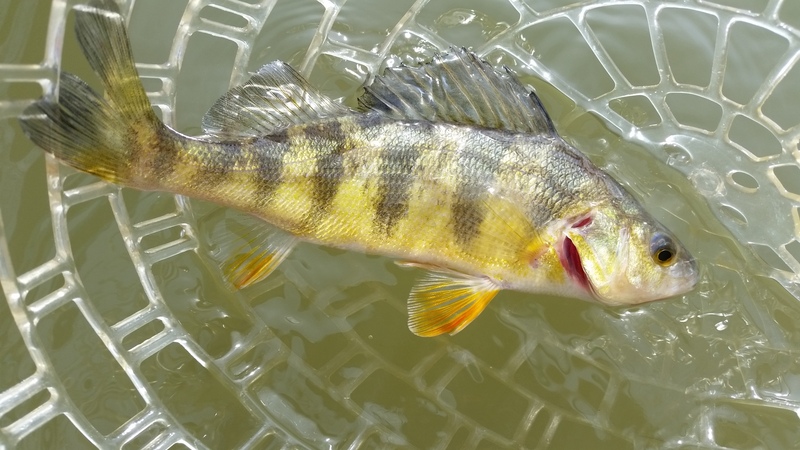 The warm temps are making a difference, and very soon the yellow perch spawn will be done and crappie will be in full swing with bass to follow. Perch spawn in 45 to 50F water and crappie in 50 to 55F water and bass somewhere around 62 to 64F. In any case, the local warmwater fishing is moving along as it should. Did a Saturday guided Trip, Tom & Levi Gates, Winston-Salem, NC, NC Mtns, we were in for some heavy rains, met Tom and his 11yr old son Levi bright and early as we expected rain and they were calling for heavy rain so thoughts were to get an early start ahead of the heaviest of the rain which did indeed arrive mid afternoon. I mentioned to the guys when it started raining, “if it rains like this if won’t take more than an hour to get the river dirty.” And so it was. (Levi pictured below with one of his fish). That was about 1pm……an hour and ten minutes later the river started changing color. Slowly at first, then dramatically. By the time we’d quit it had risen a foot and was blown out. We fished til 4pm, even catching some fish in the mud. In fact, the fish of the day came around 4pm and the river was both high and muddy proving YES what I have always preached and believed…..some fish do eat when its like this. This was the guys’ first time fly fishing, they landed btween 12 and 15 I guess , counting some fumbles at net, and one fish was a 20″ plus citation rainbow landed by Tom. But a good day despite being in rain 80% of the time. But today was the day they had to do it so we made the best of it. By the time we quit a majority of waters both where we were were very muddy or high and blown out. Here is a pic of Tom and his rainbow…. Had to cancel a Monday float, but on Tuesday did a guided Trip, Dr Ken Karb, Greensboro, NC, Dr Hy Muss, Chapel Hill, NC, NC Mtns, a warm day and quite windy, expected to see bugs and we did, plenty of caddis flying but still none of our early mayflies yet even though I measured the water temp at 54F. That’s up 20F from a week ago. We didn’t see any risers at all, which was a little suprising, but not unusual as we have had cool weather up til now and the water was still up where we were as in a lot of places. Hy and Ken put about 35 to 40 fish in the net today, a mix of rainbows and brookies, and we had a brown that was a two footer come off within a rod length of the net. 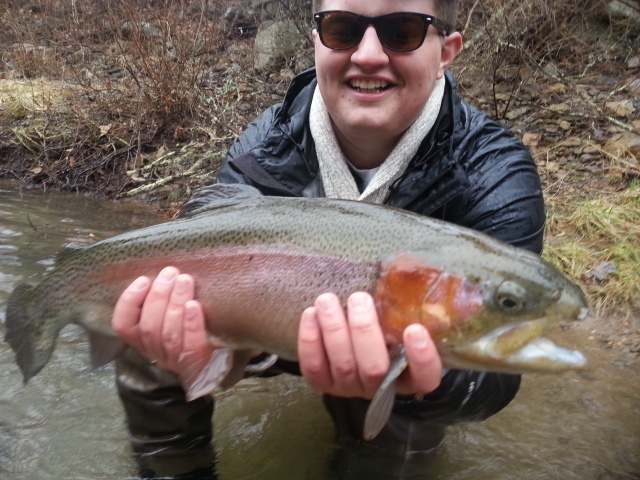 A huge fish, tremendous girth, and a wide square tail that looked like it was larger than my hand. We fished a full day, and it was actually hot at times when the sun poked through, but we had enough clouds here and there to keep it pretty pleasant. First time all year I’ve started the day in a short sleeve casting shirt and finished the day the same way. It was that warm, even at 9am. A busy end to the week, will be guiding a Wednesday trip with Ron Zambor, Winston-Salem, NC, then Wesley and Eli Gormus, VA, we’ll be at Escatawba Farms on Thursday with those guys, and on some NC mtn waters guiding Patrick McDaid, Greensboro, NC, on Saturday. A busy week for sure, and our 70s and 80s are going back to 30s and 40s. But that’s okay, it had gotten too warm too soon so I’m ok with whatever we have. Have a great evening……Tight Lines…. Light Rain, Low Sky, Tons of Bugs…. Wed. Mar. 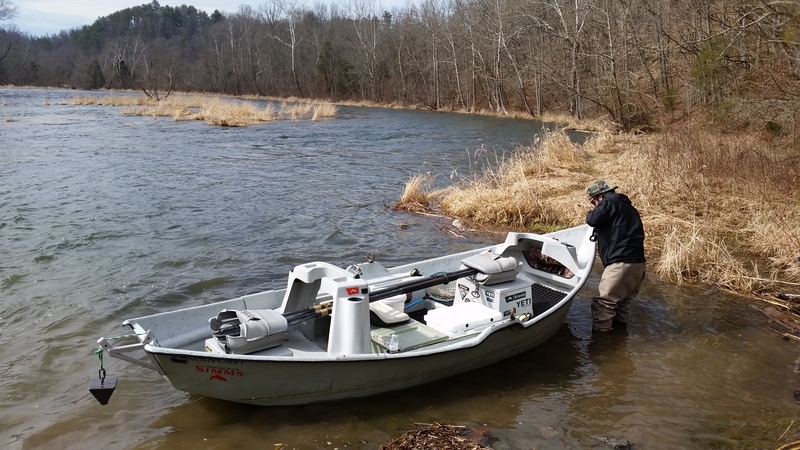 11, 2015 …..What a nice day…..for fly fishing that is. 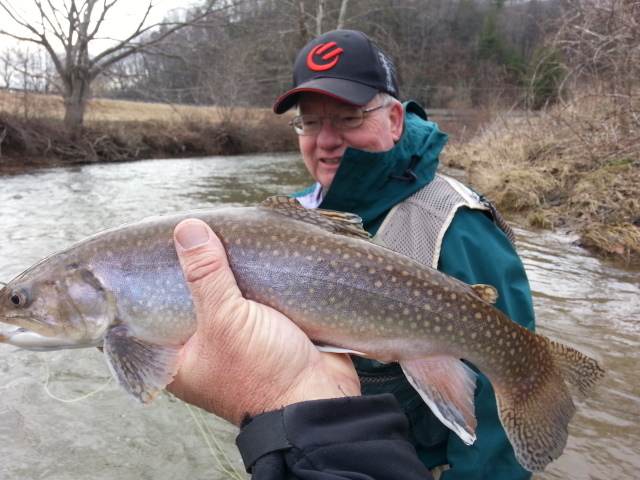 Cloudy, mild, and light rain along with tons of small dark caddis and blue winged olives and many rainbows and brookies made for an excellent day. Perfect day really…. 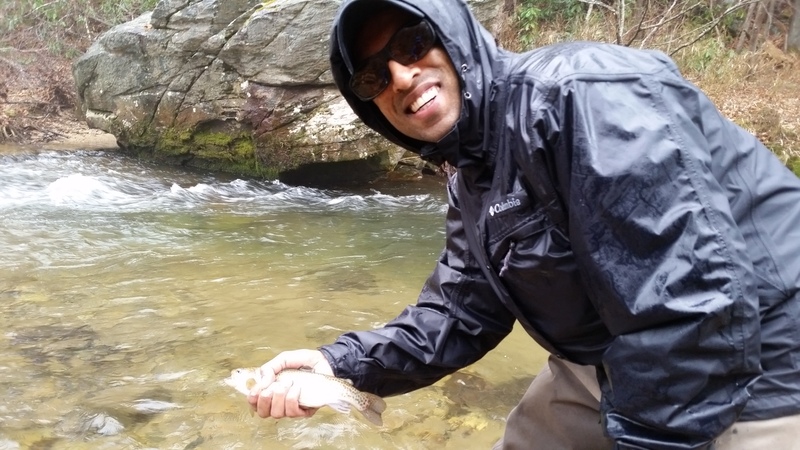 Guided Sandeep Mazumbder , Winston-Salem, NC, who is an Economics professor at Wake Forest University and on spring break and who enjoyed a great half day trip putting 20 or so rainbows and brookies in my net. 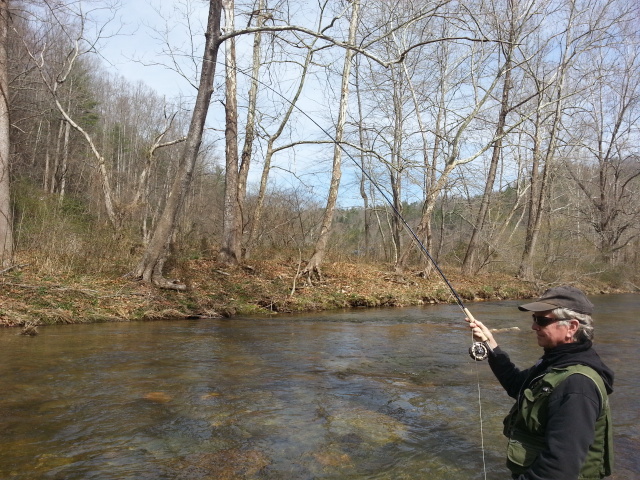 We had a great time, and I am seeing the first of the caddis and bwos on some area NC waters. Water levels are dropping nicely and clearing and many locations are about as perfect as it gets. There has been some rain this week and today but it didn’t affect flows in any way. At 2pm we called it a day and are headed out of the hills . Looks like some more rain, possibly heavier stuff and some thunderstorms are moving in. The rain should end by this evening and for most places it won’t affect the fishing much at all. Tues. Mar. 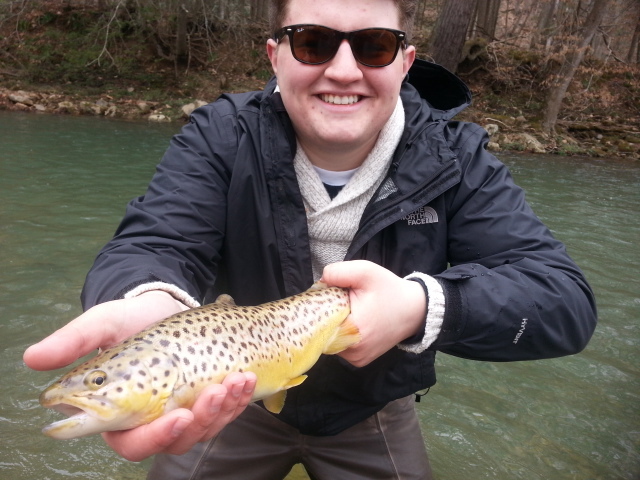 10, 2015 …..Floated the SoHo with my son Ben and we had challenging fishing as the TVA was dumping extra water and with some tribs still high it was flowing about 8 inches higher than normal full flow. We still managed some nice fish, maybe 10 mix of rainbows and browns and one 18-20" brown that ate a 5 inch white streamer but came off six feet from the boat. We had to fish with a ton of weight and anchored up on several spots are dredged the bottom. We saw a few olives late afternoon and some rising fish, Ben nailed a nice fish but then several other boats floated through and the fish went down . It’s about 630am and we just made it to take out. Nice day, challenging fishing….but hey the water will drop some in the next week and it will be game on. Have a half day trip tomorrow guiding Sandeep Mazumbder from Winston-Salem, NC. Sandy and I do several trips a year and looking forward to putting some fish in the net. Enter your email address to subscribe to this Fishing Report and receive notifications of new posts by email. Our Fly Hook of Choice….